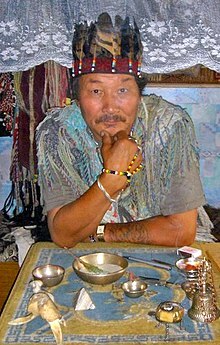 A shaman doctor of Kyzyl, 2005. Shaman priest of North America, 1897. Shamanism is a practice where a practitioner reaches altered states of consciousness. Supposedly, the shaman perceives and interacts with a spirit world, and channels these energies into this world. A shaman is a person regarded as having access to, and influence in, the world of good and bad spirits. They usually enter into a trance state during a ritual, and do divination and healing. To become a shaman, a person has to have had a near death experience (a "shamanic illness"). The name "shaman" comes from the Evenki people in Siberia. Shamans play a central role in these movements, as they can be in both worlds, this one, and the world of spirits. Spirits are real and can do things in the real world. There are good and evil spirits. Healing can be done in the spirit and real world. A person's spirit can leave their body and go into the world of the spirits. Animal shapes are used to interact with the spirits. Shamanism is different from animism. ↑ 3.0 3.1 Stern, David. "Shamans: Masters of Ecstasy". National Geographic. Retrieved 25 February 2016.